"You wanna get Capone? Here's how you get him. He pulls a knife, you pull a gun. He sends one of yours to the hospital, you send one of his to the morgue. That's the Chicago way. And that's how you get Capone!" Brian De Palma has always been a well-respected director (well, until recently, that is), but he has always worn his influences on his sleeve. Whether offering an "homage" to Hitchcock with Sisters or to Kubrick in Mission to Mars, De Palma has shown that he isn't afraid to borrow from those that went before him. Still, it is difficult to deny that, despite his sometimes unoriginal camerawork, he is an immensely talented filmmaker. 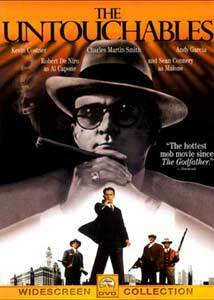 This is abundantly clear with The Untouchables, one of his best films, and one of the standout movies of the 80s. In the 1920s and 30s, the U.S. government got the insane idea that enacting prohibition of alcohol would cut crime and violence in America. Excuse me while I say, "Ha!" Of course, their plan backfired, to say the least. Sure, alcohol was illegal, but everyone still wanted to drink. So underground crime rings popped up to either import or bootleg liquor to supply it to the public at a nice, tidy profit. As the mob got more and more powerful, they began to exert influence over politicians and the judicial system, "encouraging" them to look the other way when it came to violence and crime related to the bootlegging operation. Mob bosses replaced the local government in the big cities. Of course, no mob boss is better known than Al Capone, who operated out of Chicago. Into this sordid situation comes Eliot Ness (Kevin Costner). He doesn't necessarily support the idea of prohibition, but as he says, "it's the law of the land." He has been assigned by the government to rid the city of alcohol and deal with organized crime run rampant. Of course, the local government feels more influenced by the mob money than one man from the U.S. Treasury Department, and Ness is made a laughingstock when a raid goes wrong. After meeting Malone (Sean Connery, in an Oscar®-winning role), an old cop who knows his way around Chicago, Ness decides to recruit a team that he can trust. Early on, the press labels them "The Untouchables." They stick to their guns; no one can get to them. Of course, Capone (Robert DeNiro) has other ideas. After watching this film for the third time, I am in awe of Brian De Palma's talent. The script, by the celebrated David Mamet, does not show any of his usual strengths; the dialogue doesn't have his usual poetic, musical style. The story presents no clear central idea, and there is no clear moral struggle. I think that a lot of the potential in the Ness character was wasted. Nevertheless, De Palma was able to extract an always interesting, often gripping film out of the less than perfect script. There are some inspired moments, which I am loath to spoil, and the finale at the train station is, frankly, one of the best action scenes ever put to film. Even after multiple viewings, the last half hour still gets my stomach into a knot. The performances are good as well. Of course, Sean Connery is amazing, and his Oscar® was well deserved. Kevin Costner is a bit wooden (as always), but his performance seems to fit the character. DeNiro is beautifully over-the-top as Capone. His portrayal perfectly captures the menace and swagger of the crime boss. Of course, he isn't given much to do, and Capone doesn't play much of a part in the film at all. I also really enjoyed Andy Garcia as the marbled-mouthed cop and Charles Martin Smith as the goofy guy (is he ever NOT the goofy guy?). Despite some problems with the screenplay, The Untouchables is a very rewarding viewing experience. I wish Brian De Palma would make more films like this, and less films like Snake Eyes. And hey, why not follow up your viewing of The Untouchables with the "Beer Baron" episode of The Simpsons to see how much sense prohibition really makes...? Image Transfer Review: Overall, I found this to be a very nice-looking transfer. Black levels were strong, and flesh tones looked accurate. However, I did notice a lot of stair stepping and shimmer on complex patterns (some of the suit jackets during the court scene look like they are moving), and there was quite a bit of visible edge enhancement in the brighter scenes. Also, the bright red carpet in Capone's hotel seemed to bleed a bit. Still, overall this transfer looks good. I don't think the problems are bad enough to avoid a purchase. Audio Transfer Review: The audio, unfortunately, doesn't come off as well as the video. The new 5.1 mix is fairly dynamic, with a lot of support for the score and sound effects in the surrounds. However, everything (but especially the score) seems tilted to the right front soundstage. At times it seemed that the main passages of score were isolated to the right front channels. The louder sound effects get, the harsher they sound. Big explosions seemed to have no base (or bass!). Dialogue was always clear and understandable, but at times the mix seemed unnatural and ADR became obvious. There even seemed to be some lip-synch problems in several scenes. Overall, listenable, but not up to par. For a studio that purports to be all about top-notch picture and sound, this mix is unacceptable. Extras Review: Recently, Paramount has been adding some nice extras to their catalogue titles; unfortunately, The Untouchables is not one of these. All that is offered, besides the standard English subtitles, is a fairly clean theatrical trailer. Still, Brian De Palma has shown no previous support for the DVD format, so I suspect the lack of a commentary track has little to do with the studio. The Untouchables stands as one of the best films of the 1980s. It also provides a last chance to see the genius of Brian De Palma before he started making hackwork like Mission: Impossible and Mission to Mars (ick). Would make a great double feature with another Paramount release: The Godfather (hint, hint).